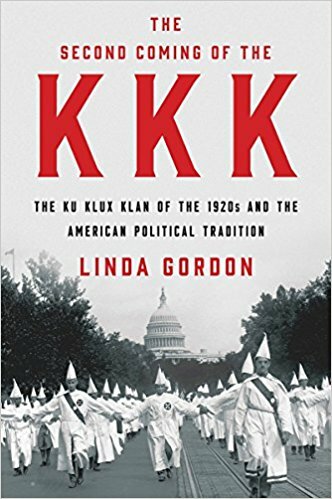 Cover of Linda Gordon’s “The Second Coming of the KKK” (c) 2017, W.W. Norton & Co.
Just as God judged the world with the Flood, He will judge it again, but the final judgment will be by fire. We have all sinned against our holy Creator and deserve the penalty of death . . . The Ark’s door reminds us that we need to go through a door to be saved. Jesus Christ is our one door to salvation, the “Ark” that saves us from God’s judgment for eternity. Every time we have gone to Ark Encounter we have seen folks – sometimes lines of folks – having their picture taken at this spot. And for good reason, given that many or most visitors are evangelicals, and given that the Ark Door is presented as a symbol of the story of salvation. As a visitor named Lisa is quoted on the Ark Encounter website, “The DOOR was awesome, only one way to our Lord” (emphases included in original). Just under Lisa’s quote on the website is a photo of the Ark Door, which is open, with the beautiful Kentucky countryside off in the distance. But as with the photo on the placard, in our multiple visits we have never seen the door open, and this makes sense. The main point of Ark Encounter is for visitors to identify with Noah and his family, who heeded God’s warning and boarded the Ark, and who were snug and dry as the flood waters rose. Salvation for Noah and his family, and if we heed the warnings in time, salvation for us. Of course, in AiG’s own telling of the story, just on the other side of the Ark Door the flood waters are rising. Innumerable animals are drowning. Perhaps twenty billion human beings — adults, children, and babies — are drowning. Think about this for any time at all, and the idea of happy tourist photos in front of the closed Ark Door becomes unbearably creepy. But Ark Encounter does its very best to ensure that visitors do not think about this. As explained in the Ark, those who are drowning are simply one gigantic aggregate of the wicked who have been justly judged by a righteous God. They are not individual human beings with whom we might identify. As Ark Encounter would have it, the Ark Door is shut, and we do not see them at all. They are not Us.